Time seemed to crawl waiting for nine o’clock to arrive. Giancarlo was going to take me sightseeing in the heart of historic Rome; at least that’s what he had told me earlier. I was anxious; if he showed, that would be great, I enjoyed his company earlier that day – if he was a no-show I would be fine, after all I was in Rome, what could be better? I had the window open whenever I was in my room; it was an older building and could get stuffy in my small temporary living quarters. I dressed fairly basic for the evening: black top and jacket with nice blue jeans and my very comfortable Mary Jane Skechers; it was a cool evening so I put on a sheer zebra print scarf, not that it helped, but it was fashionable. Everyone in Rome wore scarves it seemed, and I wanted to blend in. It was quarter ‘til nine – I knew because there was a church nearby that chimed its bells at every quarter hour, and then at the top of every hour with the corresponding number; no need for a watch in this part of Rome. I went over to close my window when I saw Giancarlo walking up the street to meet me, just as he promised. He saw me, waved then blew me a kiss. I could feel myself blushing; I felt like a teenager once again. As I walked out through the big ornate doors of my hotel, he came up and greeted me as I saw so many Romans do, with a kiss on each cheek. “Buonasera Laura! ” My heart skipped a beat as he took my arm in his and lead me down the street. 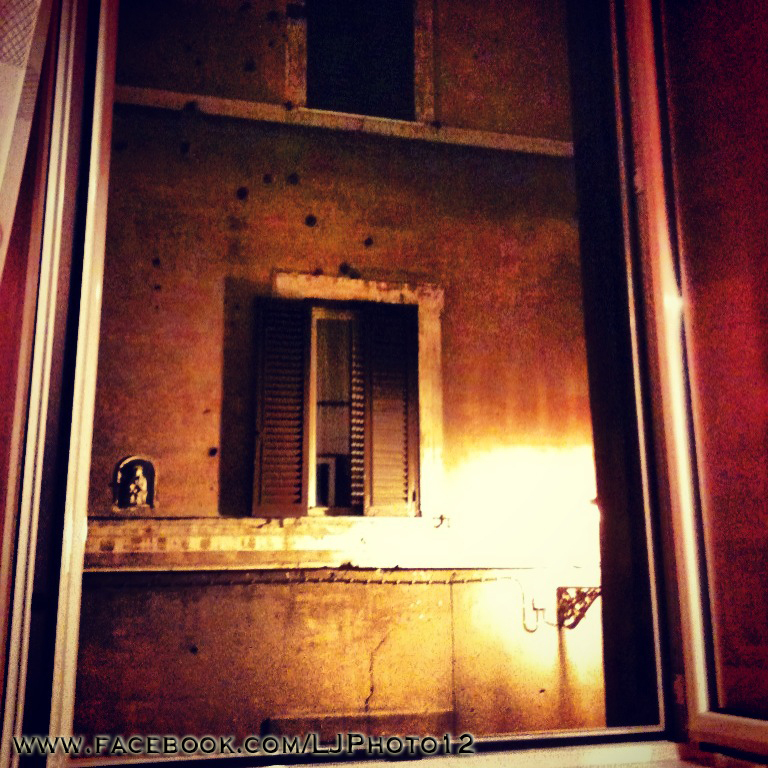 It was my first la passagiata in Rome with my handsome Italian companion, and off to the Pantheon we went. 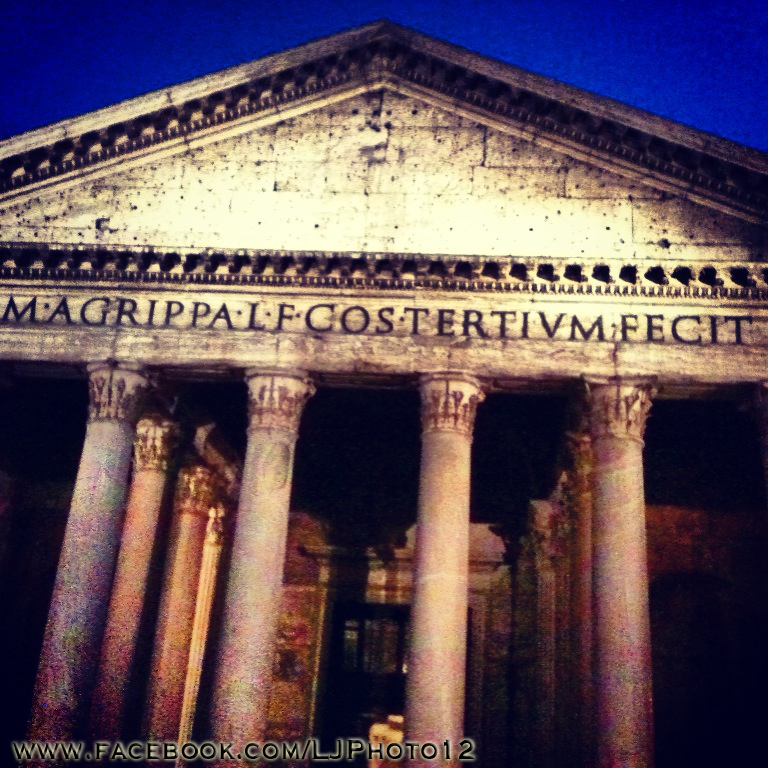 I will never forget seeing the Pantheon for the first time; I gazed upon it’s magnificence in the twilight of the evening. The Pantheon was so much larger than I had imagined it and surprisingly I started to remember my years of Latin class from over twenty years ago. As we walked around the Pantheon, I gave Giancarlo a lesson in history, spouting off all I remembered about this stunning building. Taking out my camera, I snapped pictures of the Pantheon in every angle possible; I couldn’t wait to return and see it in the daylight. We started talking about photography and Giancarlo decided he wanted to be a subject, without being the main attraction, in a photo; he ran up an alley and I photographed him walking toward me. 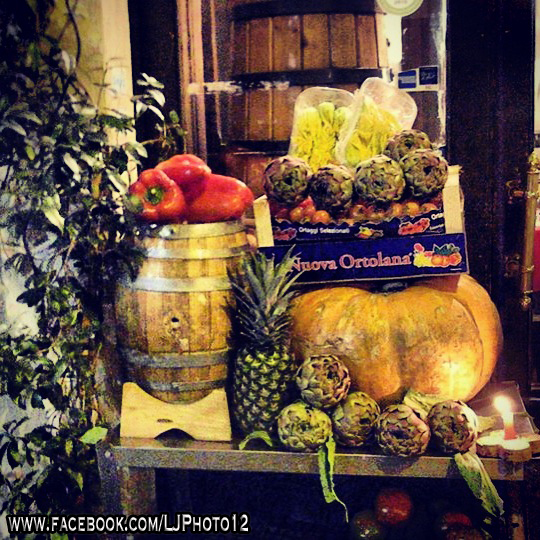 I have this photo on the wall of my apartment; one of my great memories of Italy. Giancarlo, who was almost six years my junior, was not only handsome, but talented as well; he told me he was a musician and played the guitar and accordion. As I would later find out, he and his two brothers, Mauricio and Massimo, played in a street band. I didn’t get a chance to see them all perform, but I did get to hear Giancarlo play his acoustic and sing; I smile just remembering the experience. I was not normally attracted to younger men, but Giancarlo won me over to make an exception. I came to find out that Italian mother’s raised their sons well in regards to respect, courtesy and of course, appreciating the beauty of women. In Italy it is commonplace that men well into their thirties still live at home – not just because unemployment was very high in Italy, but because families were very close; I regretfully could not relate to this family closeness. His family owned a little trattoria/osteria well hidden from the tourists of Rome; they served amazing food and delicious wine. 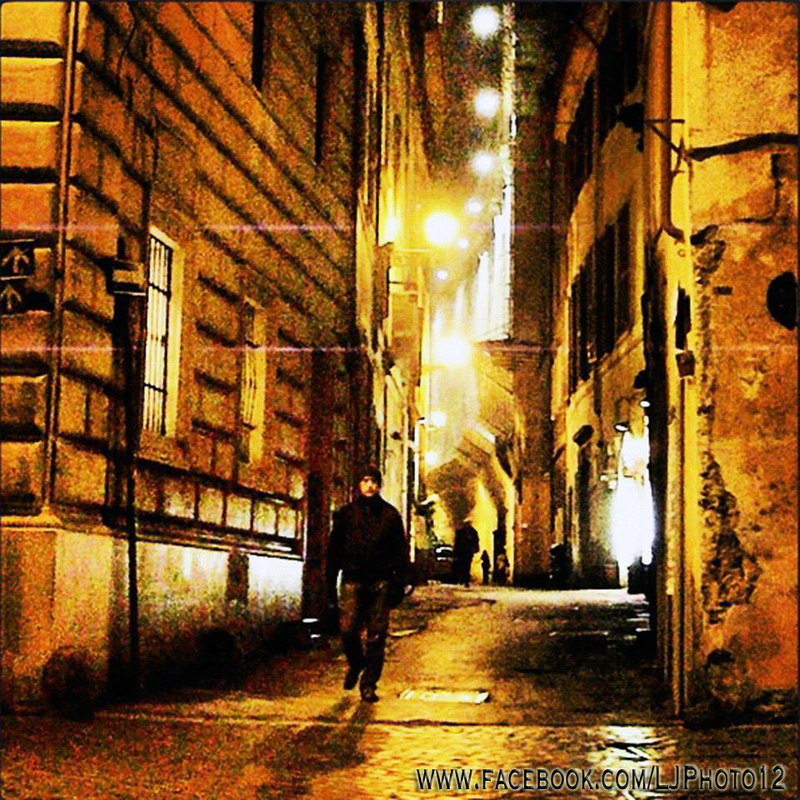 I would tell you the name of the place and where it is, but they want to remain hidden away from the turisti of Rome. After taking in all we could of Piazza della Rotunda, Giancarlo took my hand in his and lead me down the street and around the corner to his favorite gelaterias in Rome: Il Gelato di San Crispino. I was thankful to him for bringing me there because I had it on my list of places to eat at; fate was at work once again. There were so many flavors to choose from but I picked a winner: ginger and cinnamon; my mouth waters just remembering it. Giancarlo opted for the chestnut and rum, and although that was amazing as well, my favorite still stands as the ginger and cinnamon; it was a definite flavor exploding food-gasm! When in Rome, you will find tons of shops teeming with inexpensive souvenirs everywhere you turn, especially near the main sights of the city. I stopped to admire some of the beautiful scarves one of the shops had hanging on a rack outside the entrance; I was curious to see if they were made in China, as so many souvenirs in the US are. To my surprise, every scarf I looked at was made in Italy; I had to buy one, they were only a few Euro Dollars. Giancarlo insisted on allowing him to show me how to tie my new scarf “Italian style”, as even men in Italy wore fashionable scarves. He placed the scarf around my neck and made a few quick twists and ties. I wish I could remember how he tied it so I could wear it that way again. Hand in hand, we made our way up Via del Tritone, towards my hotel. 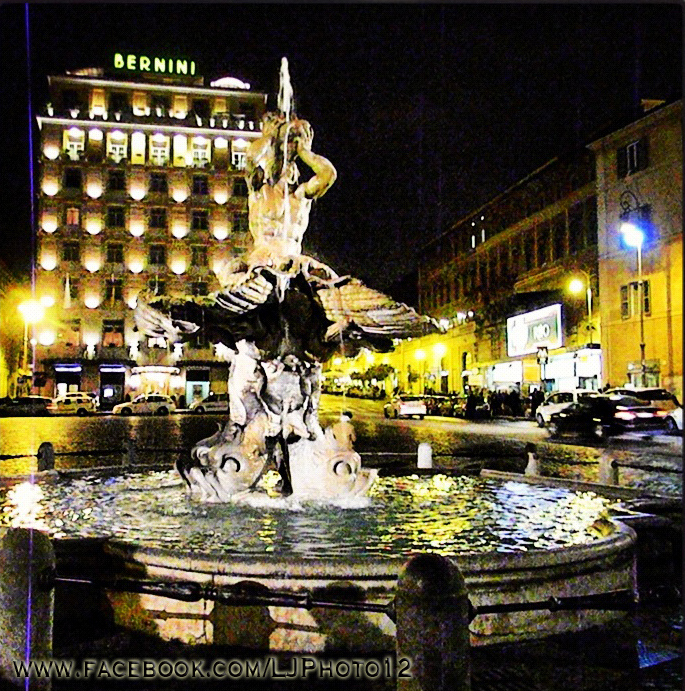 Instead of ending the night there, we walked up to sit in Piazza Barberini near one of Bernini’s famed fountains, Fontana del Tritone. We talked and laughed for a few more hours, not realizing how much time had passed us by; evidently neither of us wanted the night to end. Yes, there were still real gentlemen left in this world – and I had to go halfway across the world to find one.